Diva, I am lost! 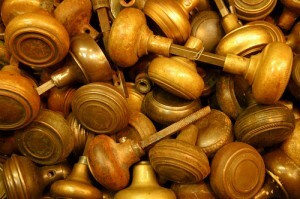 I’ve been everywhere in town trying to find the best antique knobs and hardware for an old Victorian we’re restoring. Seems like it’s either modern or forget it these days. Are there not still companies that support folks like me trying to keep things looking authentic in an older home? Help! Any ideas are appreciated. Well Amy, it’s true that finding antique knobs and hardware will prove tricky when you are working within a limited area for your search. If however, you opted to expand your search to the Internet, you may be pleasantly surprised at just how many companies are offering solutions that might meet your needs. The first step will be to determine whether or not you want something authentic or a reproduction for antique knobs and hardware? Clearly, going with an authentic set of door knobs or other related hardware for an old Victorian can get to be very costly, very quickly. And that is fine, if you’re looking at the property as an investment. However if your end goal is merely to restore some of the charm without resorting to such a hefty price tag, there is something to be said of high-end hardware reproductions. Sites like Charleston Hardware Company or Look In The Attic. Either of these online shops provide for a fantastic starting point to get your quest for antique knobs and hardware off to a strong start. Regardless of what you end up using, remember to let the Internet be your guide for price and style comparisons. Sometimes nothing beats using a search engine to find what you’re looking for. Good luck!